Our new USB 2.0 Isolation Adapter is the first of its kind to fully support USB 2.0 480Mbs data transfer speeds and remain backward compatible with USB 1.1. Includes a 6ft USB.2.0 screw lock mechanism cable for connection. 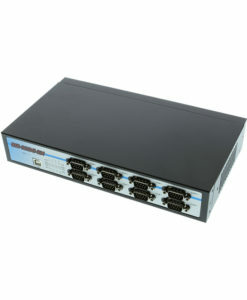 CoolGear has developed the only true high speed 480Mbps USB 2.0 Isolation adapter currently in the market! Where other USB isolation adapters have had a maximum transfer rate only in the full speed range of 12Mbps, this adapter utilizes full USB 2.0 capabilities and is backward compatible with USB 1.1. The USB 2.0 isolator adapter is fully compliant with USB 2.0 and provides a unique feature to work in the bus-powered mode without an external AC power adapter, which makes It’s very convenient for light power consumption USB devices. The external DC jack is used for self-powered mode if you need more power on the downstream port.